HT Lead Black Copper Cored Units of 2 feet 61cm 7mm diameter UK made. 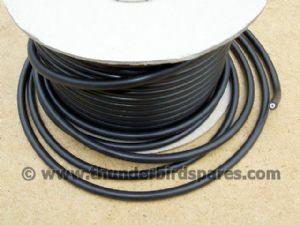 HT Lead, Black, Copper Cored, Units of 2 feet (61cm), 7mm diameter, UK made. This is new , good quality UK made, HT lead with a copper core and black outer suitable for classic bike applications (7mm diameter). We sell it units of two feet (61cm) in length so purchasing 1 item will give you 2 feet, 2 items 4 feet and so on (we will supply it in one uncut length though, not in two foot pieces! ).